Signia continues to deliver quality hearing devices, and their newest product is no exception. They recently unveiled a new hearing aid that’s in a class of its own. 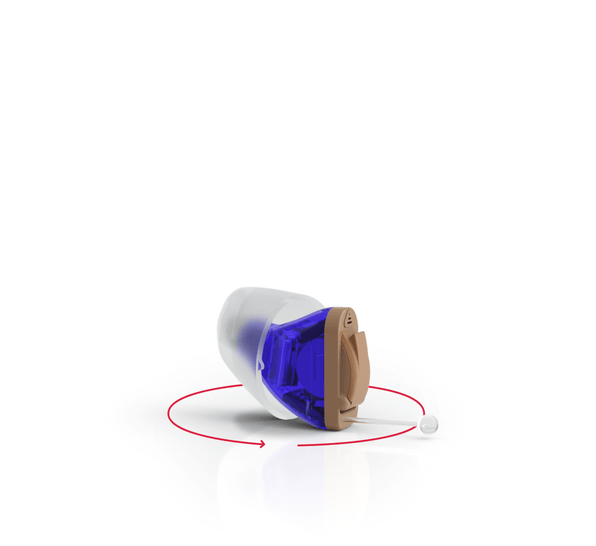 The Silk primax is the first completely-in-canal (CIC) hearing aid that provides a sealed and comfortable fit without the need for a custom mold! It’s the ultimate in ready-to-wear technology, never before seen in an in-the-ear model. It merges the ease and simplicity of receiver-in-canal hearing aids with the discreet fit of CIC devices, all without a custom fitting. The secret to Silk is the ingenious Click Sleeve design. These adaptable, soft silicone sleeves wrap around the hearing aid and easily click into place. Silk provides all the power and programs you need in a device that fits comfortably and snuggly deep into the ear canal where it sits safely, and most importantly, barely noticeable to the wearer and nearly invisible to everyone else. The Click Sleeves come in either closed or open designs, and are vented to ensure comfort in wearing and listening. There are three sizes to choose from, allowing them to fit easily and securely into any ear canal. The soft silicone design means Signia Silk aids are comfortable from the moment you put them in, and the fit rivals that of custom made ear molds, with no feedback or discomfort. Silk gives you the hidden CIC fit without the need for a custom fitting that’s required of traditional hearing CIC aids. You can try out a Silk primax and walk out the door the same day with a brand new CIC hearing aid that fits you perfectly and gives you subtle hearing without drawing any attention. Signia wanted to give first time hearing aid wearers a discreet option for testing new hearing devices and adjusting to life with hearing aids. The nearly invisible design is great for first time wearers who don’t want any fuss, and want to try a quality hearing aid without first waiting for a custom fitting. Afraid you’ll wait for a custom-made hearing aid only to discover the listening experience is not the right one for you? Silk is available off the rack but still provides top notch quality and advanced programs, all with a fit that rivals any other hearing aid on the market. You now have a chance to take hearing aids home and try them right away. Simply attach the swift fit Click Sleeve, and pop in the Silk primax to experience a whole new way of listening. Silk is also a good choice for those who already wear hearing aids, but are looking for a change. There’s no need to sacrifice comfort or fit, and you’ll gain access to a whole new world of hearing with all Signia’s latest advancements and programs. The best part about Silk is that the easy to wear design doesn’t compromise the power or performance we’ve come to expect from Signia. The primax platform is extremely powerful, and boasts a wide range of programs and performance. Silk primax might be a tiny hearing device, but it’s packed with advanced features to meet every listening challenge. From the world’s first binaural OneMic directionality to a leading tinnitus therapy program, Silk primax will not disappoint. The wireless CROS transmitter gives you advanced speech understanding by sending audio signals processed by one hearing aid to the other ear, so you’ll hear all the important sounds in both ears. Silk uses the latest e2e wireless 3.0 system, allowing the hearing aids to communicate with each other and automatically adjust to the listening environment. For discreet control, download the easyTek App on your smartphone, and manage your device directly from your palm. You can change between programs, control volume or directionality, adjust tinnitus settings, and easily check the battery status all with perfect easy and discretion. Silk also connects to Bluetooth enabled devices, giving you lots of connectivity options for easy listening. Signia primax is known for clinically proven reduced listening effort. All Signia hearing devices feature SpeechMaster and EchoShield, which work together in SoundBalance to identify which sounds are important, and reduce distracting sounds. In fact, a study conducted in 2015 at the University of Northern Colorado found that using primax hearing aids significantly reduced listening effort and provided advanced hearing and comfort to wearers. If you want to test the revolutionary Signia Silk hearing aid and experience the first CIC device that fits perfectly without an earmold, visit us today to find out if Signia is right for you.